What is the difference between a screening and an assessment/evaluation? A screening is a quick look at skills that is then used to make recommendations which could include a full assessment/evaluation. An assessment is a more in-depth experience that delves deeper in to a child’s strengths and weaknesses to make more specific recommendations and create a plan of care if necessary. 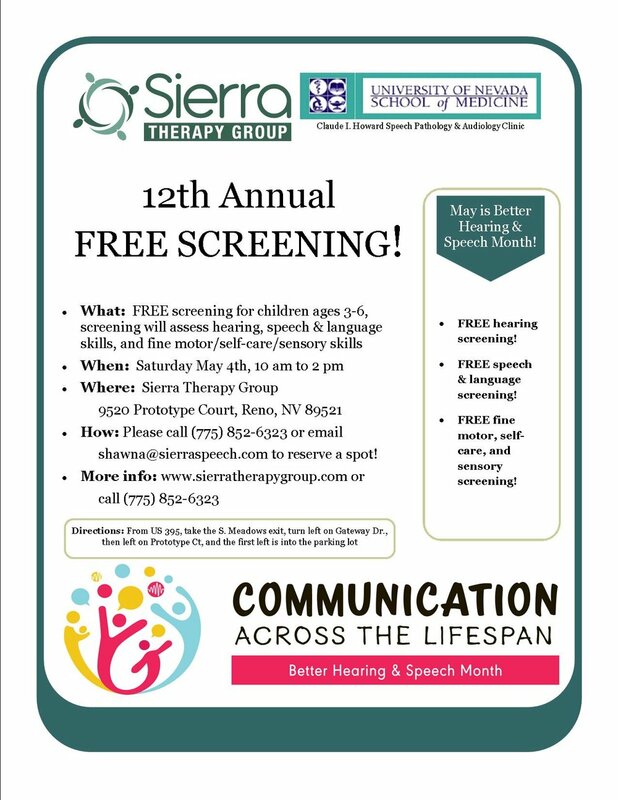 May is Better Hearing & Speech Month (BHSM), and for the past 12 years, STG has celebrated by offering a FREE screening. Licensed speech-language pathologists, occupational therapists, and an audiologist are teaming up on Saturday, May 4th to offer this screening again. If you have a child age 3 to 6 and are concerned about his/her speech-language skills, fine-motor/sensory skills, or hearing, please email shawna@sierraspeech.com to reserve your slot (slots do fill up, so don’t wait to sign up! ).